A sliding screen door lets fresh air in without bugs or debris, and provides an escape for cleaning and cooking odors. There are many varieties and sizes of sliding screen doors available at home improvement, hardware and window stores. Installation is easy and takes minutes to complete. Measure the height and width of the sliding glass doors. Standard glass doors are 6 feet 8 inches high; glass doors also come in 6 feet 11 inches or 8 feet heights. Visit hardware stores, home improvement suppliers and specialty shops for windows and doors. There is a wide variety of frames, screening, roller devices, finishes and colors. Consult with the store representative regarding measurements and desired features. 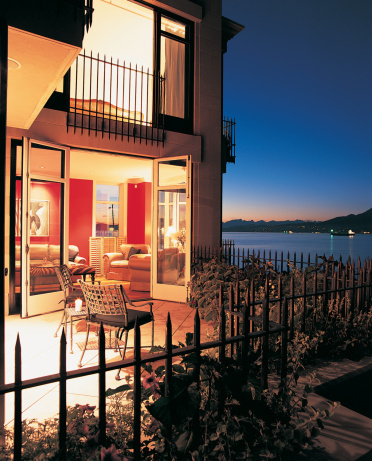 The screen door must be placed outside the sliding glass doors. Hold the door by the sides of the frame with both hands, keeping the top of screen door parallel to the glass door. Place the top wheels on the outer track of the door frame. Hold the top rollers against the upper track and push the door up to retract the upper wheels, allowing the lower wheels to be set over the track. Carefully place both of the lower rollers on the track. Adjust the rollers if necessary. A door that is too low can fall off track; if it is too high, the door will not slide easily. Sliding screen door rollers are spring-loaded, with adjustment screws located over the wheel or inside the vertical frame. Make clockwise turns with a Phillips screwdriver to push the wheel outward and raise the door, or use counterclockwise turns to retract the wheel and lower the door.